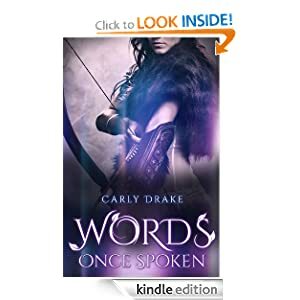 Carly Drake has a compelling story with a few plot holes, and a writing style that is hard to overcome. But if you do, I promise it is worth the read. I love the world and though I wish it was in anything but first person present tense, it had me turning pages! Medieval England (I believe, though the setting isn't clearly laid out in the beginning), Fae and many different beings supernatural all come together. This isn't exactly original but it has an edge of something special, something that falls flat from realizing its potential. I hate first person present tense. I hate it. I don't think it can be written well. I don't think it is written well in this piece. Past tense would have made a big difference. And for that I can only give it four stars. Somewhere between chaste and adult this work has adequate romance. I just wish that it was not quite so easy and clear cut. I would have liked a little more complexity in the story, a bit more development between the relationship between the love triangle. It deserves more. I want to root for these characters and I want to love Evie. I recommend this work and I know it is a delightful read. Please check it out on Amazon.